Selling bakery products in China: Chocolate! This is from one of those daily newsletters I get about what’s happening in the food industry. This one covers baked goods, snacks, and candy. And this particular collection of articles deals with chocolate as an instrument of international trade policy. I can’t help thinking about all those calories in chocolate-laden baked goods, and their effects on Chinese waistlines…. USDA’s Economic Research Service has a new report on China’s investment in agriculture and farmland. China’s outward agricultural investments are growing rapidly. The purchases are everywhere: Indonesia, New Zealand, Bulgaria, Jamaica, etc., but some is in the United States. China owns Smithfield, for example (see previous post). The report is worth a serious read. If you aren’t up to that, take a look at the tables and figures. I wanted to reproduce a lot more of them. Chinese buy Smithfield: What about food safety, the environment, community health, animal welfare, worker rights? The acquisition positions Smithfield to expand its offerings in China through Shuanghui’s distribution network. Shuanghui will acquire all of Smithfield’s outstanding shares for $34 per share in cash, which is a 31 percent premium…Smithfield’s stock price rose nearly 28 percent to $33.20…Smithfield’s common stock will no longer be publicly traded, and the company will become a wholly owned independent subsidiary of Shuanghui. We are excited about this…Together, [Shuanghui and Smithfield Foods] can be a global leader in animal protein…We are No. 1 in China; Smithfield is No. 1 in the US…Chinese consumers like American pork. US farmers want foreign markets for their pork. This will be a win-win for both countries. This deal with the Shuanghui – a company with a very recent history of producing tainted food – raises the specter that Americans will lose more control of their food supply, be exposed to tainted food and be left with even more devastated farming communities and drinking water supplies as a result of increased industrialized meat production. The New York Times put this sale on the front page and Stephanie Strom has an even longer piece on it in the business section. The Washington Post also had plenty to say. Smithfield, you may recall, is a company famous for factory farms, pollution, and truly appalling labor practices documented, in among many other places, the movie, Food, Inc. In 2009, I commented on a previous attempt by Smithfield to sell out to a Chinese company. Let’s not be too xenophobic about China. China already owns vast amounts of American real estate, holds vast amounts of American debt, and produces vast amounts of the food we eat–globalization in all its glory. We can no longer survive without China so we better figure out quickly how to make this marriage work. We also better figure out how to make our food production system more sustainable and less harmful to farm animals, the environment, farm workers, and consumers. I was a member of the Pew Commission on Industrial Farm Animal Production, which released its report last April. Our report fully documented how CAFOs (confined animal feeding operations) are not nice to animals; pollute air, soil, and water; turn communities into garbage dumps; and promote transmission of nasty—and often antibiotic resistant–microbial diseases to farm workers, community residents, and everyone else. One major finding of the Pew Commission was that laws protecting communities and the environment currently exist; they just aren’t enforced. Too bad for anyone living near an industrial pig farm. Additions, May 31: Reuters discusses the ractopamine issue, said to be key to understanding this deal. The Chinese do not allow use of ractopamine as a growth promoter, but the U.S. does. Once Smithfield started phasing out its use, the deal became possible. Ractopamine is a beta-agonist. Initially developed to treat asthma in humans, ractopamine was found to be extremely effective at changing the metabolism of an animal, so that the animal would quickly and cost-effectively add sought-after muscle. The FDA approved the use of beta-agonists in pigs in 1999, for cattle in 2003 and for turkeys in 2008. Helena Bottemiller writing on NBC News, also discusses this issue. In March, Smithfield Inc., converted its Tar Heel, N.C. plant – the world’s largest pork processing facility – to slaughter only hogs that were raised without the use of ractopamine….the company’s product line will be 50 percent ractopamine-free as of June 1…Earlier this year, China and Russia demanded that all American meat exports be certified ractopamine-free. The U.S. government initially refused these certification demands, so Russia shut down its market to U.S. beef and pork in February. Addition, June 1: The New York Times writes that the Committee on Foreign Investment is about to undertake a national security review of the deal. The big questions: Are Smithfield’s sales to the military secure? Does it use special farming technology that could be transferred to China? Will Shuanghui have the power to disrupt the U.S. food chain for pork? Another addition, June 1: Apparently, Shuanghui has a history of findings of maggots, excessive bacteria and illegal additives. Addition, June 4: Guess who owns half of Shuanghui, the company that wants to buy Smithfield: Goldman Sachs, among others. 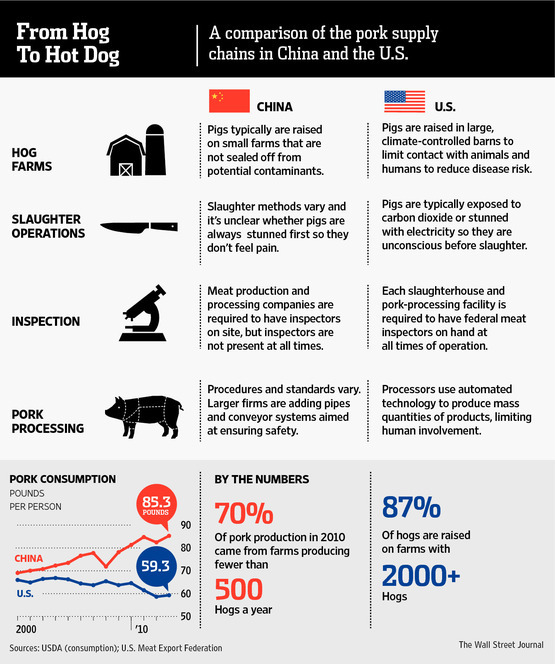 Addition, June 5: The Wall Street Journal has this helpful graphic comparing the pork supply chains in China and the U.S. along with an excellent summary of the issues involved.